With the Frida Kahlo Museum recently opening its second location in the world on Playa del Carmen's bustling Fifth Avenue, Mahekal Beach Resort curated an inspired experience for culturally-minded travelers looking to awaken their creative spirit. For a glimpse into the brilliant mind of one of Mexico’s most iconic artists, guests enjoy a self-guided bicycle tour of the ever-vibrant Fifth Avenue, complete with an exploration guide outlining must-see stops, ending at the Frida Kahlo Riviera Maya Museum. After an immersive look into Kahlo’s world, enthusiasts return to Mahekal to discover their artistic talents through a hands-on painting lesson at the Artisan Palapa with a local master of her craft before indulging in an interactive culinary adventure at the Mayan Culinary Casita… Mahekal has crafted an experiential “Artisanal Escape” allowing travelers to connect to the area’s history, people, and culture. Personalized hand-painted ceramic plate welcome amenity. Two daily signature cocktails from Boli’s bar. Passes to the Frida Kahlo Museum Riviera Maya. Interactive lunch for two at Fuego where guests help native Mayan chefs prepare a gourmet feast while getting a taste of ancient culture – complete with Mayan rituals, hands-on interaction and rich, historical tradition. Hands-on “Sips & Strokes” painting lesson at the Artisan Palapa with Juliana, a local master of her craft. 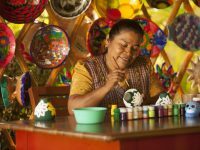 Budding artists carefully select an item to paint from the rows of figurines lining the tables, before the talented craftswoman lends inspiration as guests keep a piece of paradise by crafting a Mayan memento to take home. Self-guided walking tour of the bustling Quinta Avenida (5th Avenue), complete with an exploration guide outlining must-see stops (or bicycles). Complimentary in-room mini-fridge stocked with 4 cervezas, 4 bottles of water and 4 sodas.